Home // Mattress 101 // What's a California King? Early on you learn “king size” is relative. There's more than one kind of king size mattress, and the two with the biggest draw is the standard king and the California king. But what is a California king? And what makes this other king “standard”? Excellent questions, ones we are equipped to answer. This article will explore why these larger beds are desirable, and it will answer the questions above as well as perhaps the more important question: what's the difference between a king and a California king mattress? If you're looking for a bigger bed, reading this will help you decide which mattress is right for you. After World War II the US economy was booming, and people were moving out of cities and into suburbs. Furniture manufactures and marketers saw the increased space of the suburban home as an opportunity and started offering larger beds, larger couches, and more bed sheet varieties. Up until this point, the majority of American couples slept on twin beds or crammed onto one full-size mattress. You can probably picture Lucy, and Ricky Ricardo tucked into their matching twin beds from “I Love Lucy.” While that setup was not as common as the TV show would have you believe, it was a reality in the America of the late 1940's and 50's. The California king mattress size was invented in the 60's in Los Angeles as a luxury item for celebrity homes. 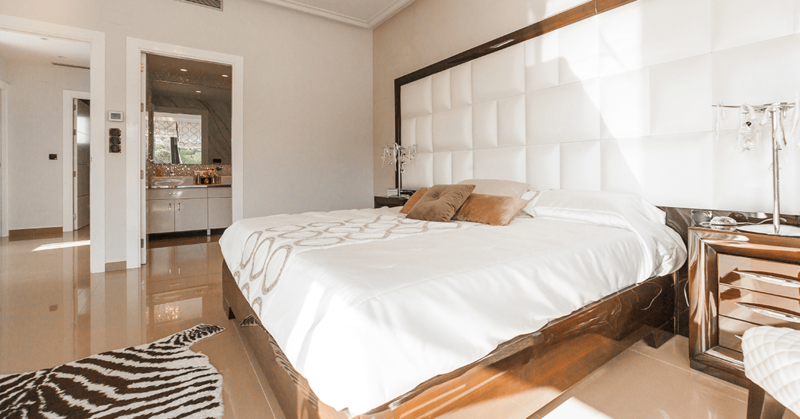 As the market for larger beds had been growing over the previous 20 years or so, this luxury item soon became more of a staple fixture on the furniture market. When the California king gained traction furniture manufacturers on the east coast followed suit and created what was called the eastern king—which is the bed we know as the standard king today. Sizes and designs of these largest of commercial mattresses varied for a time, and multiple makers in several global markets made their own versions of the king. However, over time these two original variants became the dominant forms of the king size bed. There is an element of status and an air of luxury that still surrounds the king-sized bed, but as these mattresses have become a bit more affordable and common, that aspect of their appeal has diminished. The real draw of the two sizes of a king is the extra room they provide for their occupants. There are some tangible and less obvious reasons why more room in a bed is desirable. For a start, there are design reasons to choose a bigger mattress. If your master bedroom is large then having an appropriately sized bed is necessary to fill the space. In a room 15 feet by 15 feet a queen bed may start to look pretty small. If you are in the position that you are furnishing a room that size then there is a good chance you will be in the market for a king of some kind. King beds also offer a large amount of under-bed storage space, which should not be overlooked. Depending on your bedframe you can create a convenient space to store any number of things neatly out of sight. For people with kids, the king size bed becomes a place the whole family can pass the time, either in sleep or as a makeshift movie theatre, board game platform, or bedtime story reading room. While kids will often sleep with their parents while they are young, especially if they are going through a nightmare phase, the communal aspect outside of simple sleep is where a lot of people find the most benefit from the broad berth of a standard or California king. For those of us who own pets, there are other draws to the king bed. Perhaps you have a cat and have been amazed at how much space such a small animal can manage to occupy in a queen size bed. Perhaps to this point you have not let your dog sleep with you because there just isn't space (there can't be another reason, right?). With a king, there is space to spare, and before you accuse us of suddenly turning this article into an appeal for dogs crowding people out of beds, there is some real science to suggest why you should let Shep or Mittens onto the mattress. Studies have shown that sleeping with a pet can have numerous mental health benefits including relief from insomnia, anxiety, stress – both emotional and physical – and can provide relief from depression. All this just from letting a pup sleep at the end of the bed. With a king size bed that is a much more manageable proposition. There seem to be real potential benefits to sleeping on, or simply owning a larger mattress, but what really separates the two types of king-sized mattresses from each other? What is a California king's size and what’s the size difference between the king and California king? A standard king size bed is now one of the more common mattress sizes in the world. Your standard king measures 76 inches wide by 80 inches long. That is 6 feet 4 inches wide and 6 feet 8 inches long, creating a near perfect square, a true palace of a mattress. The standard king also offers what are essentially two extra long twin beds combined into one larger mattress. In fact, it is not that uncommon for couples with differing preferences in mattress firmness to purchase two twin beds and mount them on a king bed frame, allowing them to customize their side of the bed (an eccentric solution and ironic considering the origins of the king mattress but worth noting). It is generally accepted that a king size bed needs a room of at least 12 feet by 12 feet to fit comfortably. The rule many decorators use is that a bed should have at least two feet of clearance on all sides so as not to dominate or clutter a room. While the standard king is a large bed it is not very much longer than other sizes of mattresses—your twins, doubles, and queens, which are 75, 75, and 80 inches long respectively. That is the key difference between the standard king and the California king. The California king measures 72 inches wide by 84 inches long, giving its design more of an emphasis on length than the width of the standard (which as we know is quite close to being square). While the difference between the two mattresses is not dramatic the California king's slimmer width makes it a slightly easier fit in some bedrooms that share a similar length, narrower geometry. From an aesthetic standpoint, the California king will do better in a room of this shape than a standard. When laying out the furniture of a room, inches can mean the difference between a comfortable flow and a crowded floor. For people of “average” build the California king will be a similar sleeping experience to the standard king. It is still a full 6 feet wide, giving a couple the rough equivalent of a twin bed's width on their own side. The extra length means those who really like to stretch out can do so to their heart’s content with little fear of bashing a headboard or hanging over an edge. Where the California king shines, however, is in what it offers taller people. For sleepers over 6 feet in height, the extra length of a California king can be a godsend. Unsurprisingly this is a very popular mattress for basketball players in the NBA. Is the California King Right for You? So, to return to the question at the top of this article, what is the difference between a king and a California king mattress? The California king offers more space for taller people and not much of a difference for people of average build. So, if you aren't terribly tall which do you choose? You can decide based on aesthetics as mentioned above, but there is another significant difference: sheet size. The standard king is very common, and sheets made to its dimensions are sold basically anywhere sheets, blankets, and bedclothes of any kind are sold. California kings are still less common than the standard and finding sheets for this size mattress can be frustrating. Of course, they are more common in California itself, if you happen to live there. The search for these sheets has grown easier with the advent of internet shopping, but the simple task of going to a local store for bed sheets is likely to cause consternation for the unwary. If finding non-standard sized sheets seems like more trouble than you want to go through for your bed, then the California king is probably not right for you. In the end, choosing between the standard king and the California king boils down to a couple of simple considerations. What is a Cali king? It is a king-sized bed with an emphasis on length. If your first priority is to have as much legroom as possible, then the California king should be your choice. What is the shape of the space you are putting it in? If the room is a little longer, a little narrower, then the California king should be a contender. In most other cases, the standard king will more than suffice as a large and comfortable sleep space. It really goes without saying that sleep is good for you. Sleep is quite obviously vital to our health. The sky is blue, elephants are gray, and we know these things. Yet, the health benefits of sleep go beyond simply “recharging the batteries” and the benefits of high-quality sleep some studies suggest go very far indeed. Numerous studies suggest that deep, restorative sleep that moves through the proper REM cycles can, for people who get enough of it, help improve their memory, recall, and accelerate learning. The right amount and the right quality of sleep may affect your lifespan, your mental health, your creativity, even a healthy appetite. We spend a third of our lives sleeping, that’s over 200 thousand hours. Finding the right mattress has a significant effect on your life, so take your time. Do your research. Explore more about the possibilities that a big mattress like a California king offers you and your sleep habits. If you're going to be on the 30-or-so square feet of fabric for that amount of time you might as well enjoy yourself.